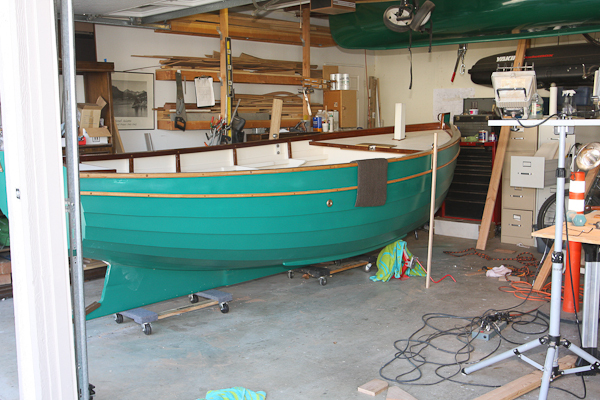 This week I worked on interior details and getting the boat ready for loading on the trailer. By Friday she was ready for the move from the garage floor onto the trailer. 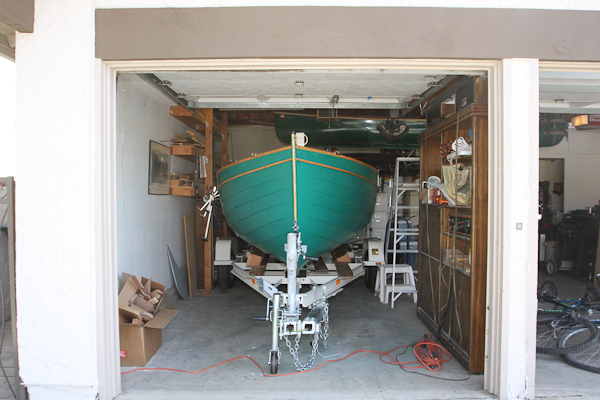 I used my garage hoist to lift the bow onto a furniture mover and then a couple of car jacks to lift the transom onto another furniture mover. 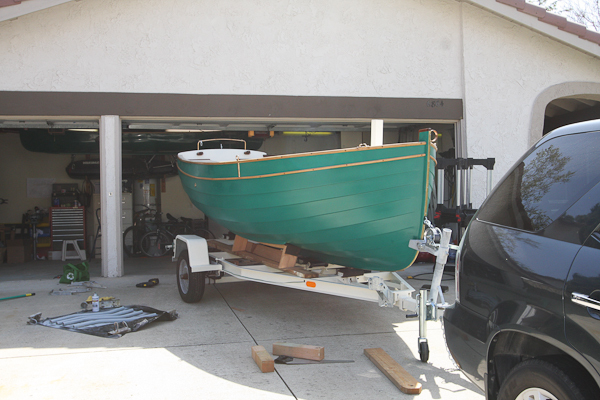 This allowed for easy mobility of the boat and I was able to swing the bow around toward the garage door. Once the boat was aligned with the trailer I used the winch on the trailer to pull “Alice Gale” onto the pads. The trailer design, a tilting bed trailer, made the transfer easier. A neighbor helped with keeping the boat steady as she was pulled onto the trailer. I used the same temporary hull stabilizers on the trailer. I still need to build a permanent runner system for the hull to stabilize loading and transportation needs. 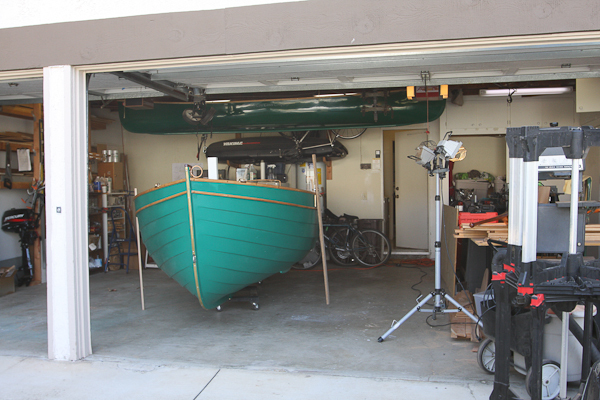 And finally at last, the big question, will the boat fit as planned into the garage. Like a glove! I have just enough room to move behind the transom to the rear door and the width of the trailer just fits through the door opening. I will miss the blog and the progress. What a fabulous sense of accomplishment. Be very proud. Looking forward to pictures from the adventures of the Alice Gale. Waw, the only thing i can think of is waw. You did a beautiful job. Guess you can’t wait to sail her for the first time. I really like ebihen, but we just got our first baby, so you will understand that a boat has to wait a little bit. In the mean time, i keep admiring you. Thank you Mick. I am looking forward to sailing “Alice Gale”. It should be within the next few months. Congratulations on your baby; family is really what it’s all about. 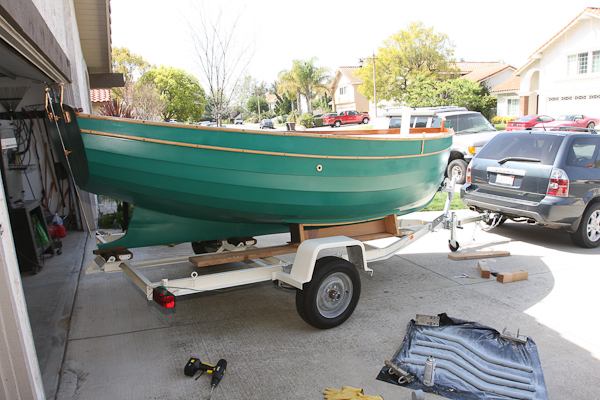 I waited until I was retired to start my boat, but I thought about it for many years. The Internet has been so helpful in providing information on building techniques and finding available plans. Getting her onto the trailer is exciting. Are you going to leave the boat there now, or take it off again for completing permanent runners, etc? I will be able to add runners while the boat is still on the trailer. I will have several runners below the waterline along with side railings for ease in retrieval. While on the road I will have a few tie downs that run over the gunwale protected by oak blocks.